Orange Klaptraps appear in Kongo Jungle. They jump out from the waterfall near the edges of the stone ledge and near the Barrel Cannons. If a character makes contact with a Klaptrap, they will take damage. Very rarely a Klaptrap will get stuck in the Barrel Cannon, and characters cannot use the Barrel Cannon while one is inside of it; they instead only take damage from contact with that Klaptrap. Blue Klaptraps appear in Jungle Japes. They jump between the opening on either side of the middle section of the stage. If a character makes contact with a Klaptrap, they will be spiked (or meteor smashed in Brawl), sending characters straight into Jungle Japes' torrential waters. They essentially serve as one-hit KOs in Melee, and in Brawl if enough damage is dealt. Characters holding on to a ledge are also vulnerable to a Klaptrap. Klaptraps do not come out of containers like other enemies do. They can however be used as regular items in the TEST stage using an Action Replay, or other hacking device. Klaptraps are invulnerable and cannot be damaged, unlike other enemies. Klaptraps are Kremlings who debuted in Donkey Kong Country. They damage Donkey Kong and Diddy Kong by biting them. They appear in a variety of colors: blue, red, purple, and green. Klaptraps later appears in Donkey Kong 64 with a similar role. Larger Klaptraps also appear in the game. 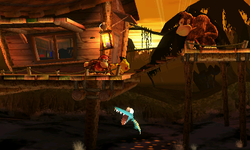 Klaptrap appears on the Jungle Japes and Kongo Jungle stages, leaping out of the water to bite opponents. The Klaptrap also makes an appearance as a collectable trophy. Klap Trap trophy in Melee. This low-slung alligator made its first appearance in Donkey Kong Country. You can subdue it by jumping on its back, but its powerful jaws make it dangerous to approach from the front. In Super Smash Bros. Melee, it swims in the river and sometimes jumps in the Barrel Cannon to stop players from using it. Like in Melee, Klaptrap reprises its role as a stage hazard on the Jungle Japes stage. Klaptrap appears as a collectable sticker. A Klaptrap as seen in Jungle Japes. Like in Melee and Brawl, Klaptrap reprises its role as a stage hazard on the Jungle Japes stage. As in Melee and Brawl, Klaptraps appear on Jungle Japes and Kongo Jungle (now named Kongo Falls). They act nearly identical to their previous appearances. Klaptrap appears in Super Smash Bros. Ultimate as an Assist Trophy. Once summoned, it runs around the stage and latches onto any opponent it touches. Once latched, it bites down, doing repetitive damage similar to the Fan. Training Mode describes its Assist Trophy: Leaps up on opponents and bites down with sharp fangs. A Klaptrap latching onto Roy on Pokémon Stadium. Klaptrap is the very first Assist Trophy from the Donkey Kong series. Klaptrap's render from Super Smash Bros. Ultimate closely resembles its official art from Donkey Kong Country. When Klaptrap is attacked in Ultimate, it makes the same sound as it did when defeated in Donkey Kong Country. This page was last edited on February 18, 2019, at 22:06.